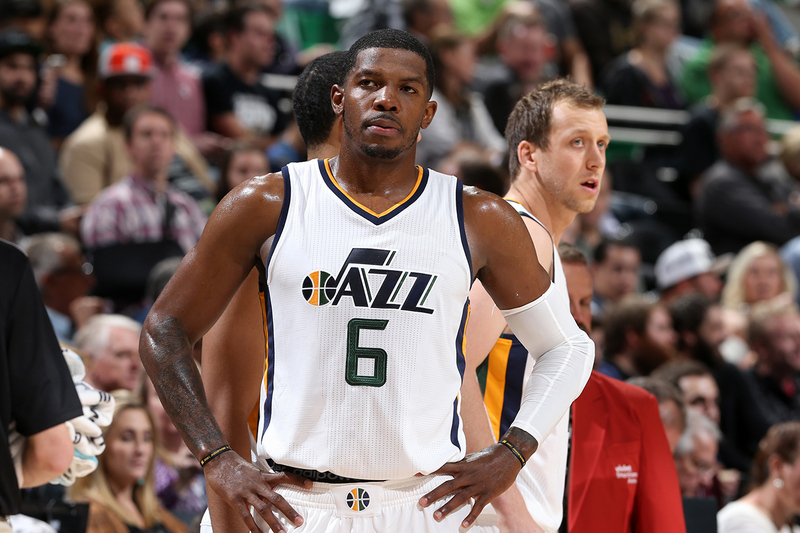 As we get ready to tip off the 2016-17 NBA season, there’s a buzz around Salt Lake City that hasn’t been here in five or six years, probably since the Jerry Sloan days. The community is really excited about the Jazz, and they have high expectations for the coming year. The start of the year is an important time period for every team. You’re trying to find your role. You’re trying to find different rotations, different lineups that you feel comfortable with. Because of the injury to my hand, we’re going to have to work through some adversity to figure that out, but I think it will give guys opportunities to be in new and different situations and roles. If you want to take steps forward, sometimes you have to put yourself in uncomfortable positions and just experience things. Depth is key. You look at all the teams that go deep in the playoffs, and they’re all really, really deep teams. Without a doubt, this year’s team is the deepest team I’ve ever played on. Outside of my hand (which I’ll get to in a bit), we’re in a really good place as a team as we head into opening night. 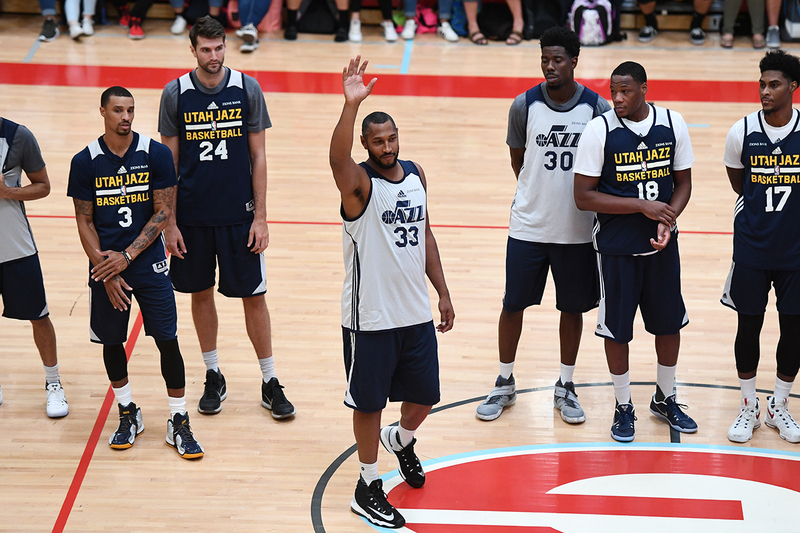 We were doing really well in training camp, and the presence of our three new veteran additions—Joe Johnson, Boris Diaw and George Hill—has been huge for us. They’ve been through it all. You can just tell on the court that they know to play the game in the way that only experienced players do. They have high basketball IQs, and you have confidence in them, in their performance and what they’re going to do. Joe’s been really good from day one that he’s been with us. He’s a natural scorer. He’s proven that he’s been able to do that over the years. So I’ve really paid attention to him and how he’s able to score in different situations with different guys guarding him. It’s been fun to learn from him already, and I know I’m going to learn from him even more. But even in the short time he’s been with us—just watching him and the patience he plays with—he’s been a huge help for us. He’s almost like instant offense, so he’s really going to help us out. Another thing you learn from Joe is just his professionalism, the mentality that he brings to practice every day. You don’t get to be 16 years in the league without being dedicated, and really taking care of your body, and all that good stuff. I’ve learned that from him as well, and he’s definitely a true professional. I’ve asked him about different players, different coverages, how he takes advantage of certain situations, and just how he’s able to still be performing the way he is at his age, with his experience, and his miles (because he has logged a lot of minutes in the NBA). He’s definitely a great addition, and a lot of our guys can learn from him. Boris is already helping out with our center, Rudy Gobert. He has a connection with him, and I’ve seen Rudy’s play pick up with Boris on the court, just being around and talking with him. Boris has a natural feel for the game. He’s a terrific passer, and he’s always in the right place at the right time. 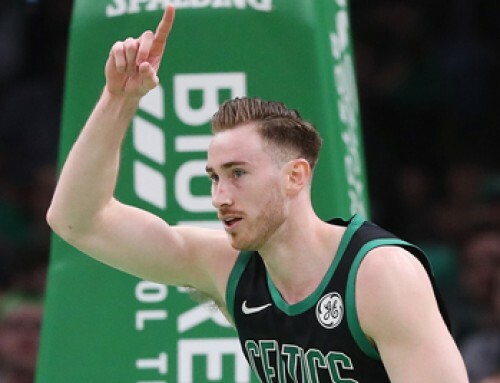 He does a lot of little things that don’t come up on the stats sheet, like setting screens, making a simple, extra pass, just different things like that, that just help your team win. He’s also versatile. He can guard the five. He can guard point guards. Defensively, he’s going to be really good for us. He will be able to switch a lot of things. Offensively, he’s a big mismatch for a lot of people. He can shoot the three and step out, and he can also post up too. And because he’s such a good passer, he’s going to get us a lot of open shots this year. So I love that about Boris. The little things that he does, those things are contagious. He’s also constantly teaching, telling people what they could have done, or things they could try differently. He’s got a wealth of basketball knowledge, and we’re happy that he can share that with us. It’s been good having George on the team. We are both from Indianapolis, so I know him a little bit already. Indiana guys just know how to play basketball. I know he’s been brought up to play basketball the right way, and it’s been fun playing with him already. To have that initial relationship with your point guard is really good for developing chemistry. George just makes things easier for everybody. He does a good job controlling and dictating the pace of the game. He is so long on defense, he’s very disruptive. He’s also another guy that’s been with winning teams and in a winning environment a lot. He also does little things that help the team out. He’ll be good for our rotation. One of the benefits for our team is our versatility, and George is another guy who is very versatile because he’s a big point guard. He can play point or slide to the two. He can guard both point guards and twos. So he’s going to be another key for us, both offensively and defensively, another guy that adds depth at multiple positions. While we’re excited about our three veteran additions, we’re also really excited about the younger players we have coming back. Dante Exum looks a lot better than he did his rookie year. He’s being a lot more aggressive already. He’s getting to the rim. He’s got a good frame, good size and good speed, so he can get to the paint pretty much whenever he wants. The next step for him will be the decision-making process—knowing what you do when you get in the paint—and that usually comes with experience, just playing in games over and over, and putting yourself in that situation. The game is starting to be a little easier for him. You’ve got to give credit to him for working so hard last year. It’s tough to sit out during an extended period of time. The thing that I like about Dante is he’s got a good work ethic. He wants to learn and he wants to be a good player. That goes a long way, for sure, especially when it comes to rehab. 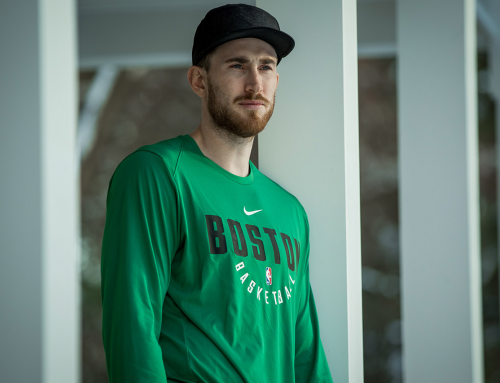 He did everything that was asked of him to get back to where he is now: coming in every single day, doing his rehabilitation, doing his exercises, watching film, still coming to the games, cheering on teammates. That’s a hard thing to do when you’re out and you can’t play, to still be able to cheer on your teammates, and come to the games, and sit on the sidelines. That’s very tough to do mentally, so you’ve got to give him credit for doing that. He’s going to have a really good year and I am excited for him. I think you will see a lot better player the second half of the season than he is now. This is still pretty much his second year, and he’s only 21 years old. He still has got a lot of growth. 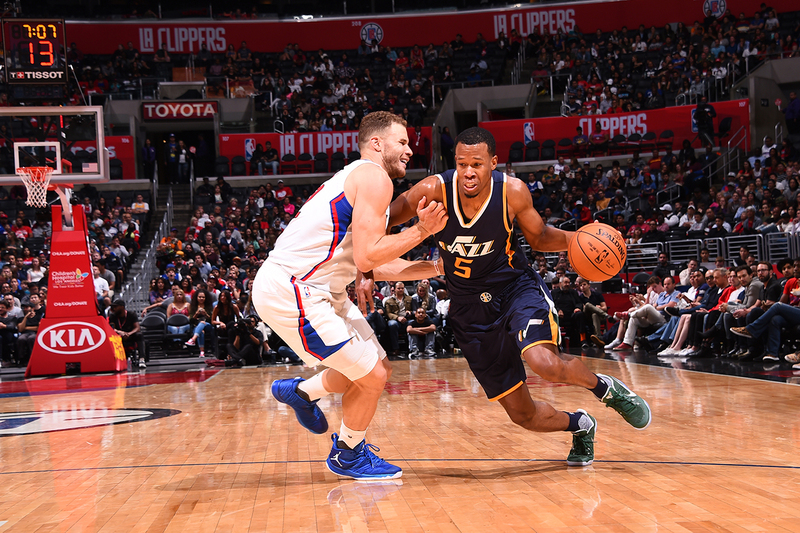 Rodney Hood took a big step last year, and we’re looking for him to take another this year. With me out, he’s going to be asked to shoulder a big load early on in the season. For him, it’s learning when to break the offense and just say, “We need a bucket. Go get one.” Because there are times in the games where you’ve got to be able to stop another team’s run, and sometimes that is just taking it upon yourself and telling the team, “Give me the rock. Let me go do this.” That’s where he’s at right now, learning how and when to do that. Joe is going to be instrumental in helping Rodney (and helping me) out with those types of things. Trey Lyles really worked on his game a lot over the summer, and his range has extended tremendously from when he was in college. He’s going to be able to really stretch the floor for us offensively. The sky is the limit for him. He’s 6’10”. He can put it on the floor. He can shoot it. He can pass it. He can do a lot of things. 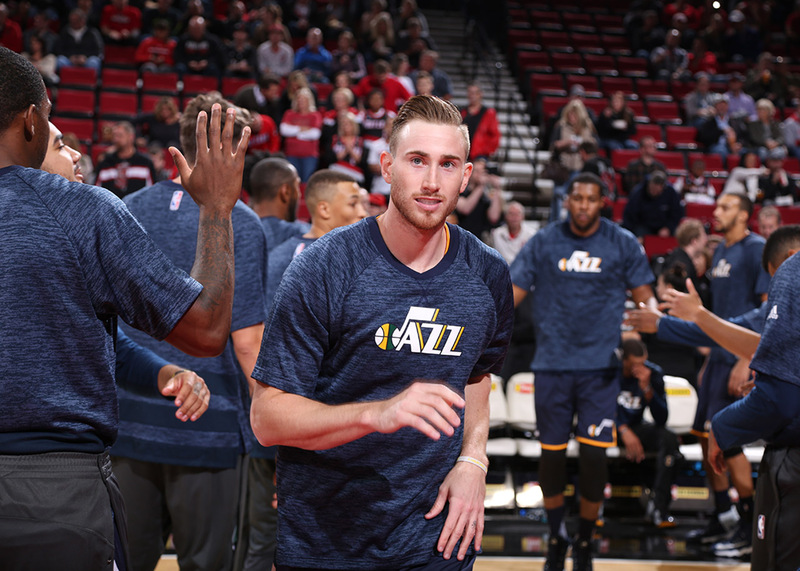 For Trey, the next thing is being just as versatile and as dangerous defensively. He’s a guy that should be able to guard ones through fives. So I’m looking for him to take a big step this year. I think he will. Rudy looks really good so far in preseason. He’s catching a lot of balls in traffic and finishing things around the rim. For us, we need him to be the defensive guy that he is, one of the best rim protectors in the league. Offensively, we need him to roll hard, catch the ball, finish, make his free throws. So far, he has done that in preseason. He’s looked really good. Derrick Favors is still battling with some stuff right now, but he looks good when he’s in practice. He’s also worked this summer on extending his range a little bit. It will be good to get him back out there on the court. Faves has always been a guy that leads by example. 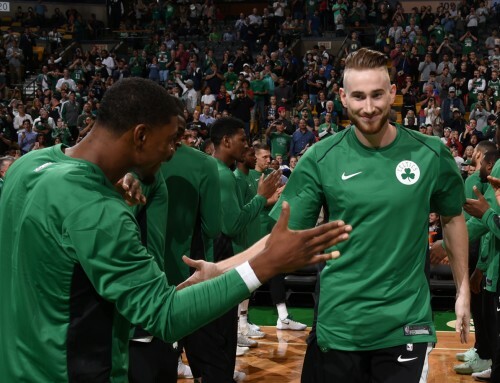 With me not out there on the court, the team is going to look to him for a little bit of a voice, somebody that they can look to on the court for a sense of calm and leadership. I think he’s ready for that. I put a lot of work in this summer to get off to a good start for the season. So needless to say, injuring my hand was very frustrating. We were in practice. I was playing defense on a teammate, and I think my hand got caught inside of him a little bit. My finger got caught on his elbow, and I remember looking down. I wasn’t really in much pain, but my ring finger was crooked. I knew that something was wrong. So I immediately went over to the trainer, and he popped my knuckle back into place. I made a fist and opened up my hand again, and it popped right back out. As soon as it did that, he was just like, “All right. Let’s go.” We walked out the door, got an x-ray and found that I had broken and dislocated my left ring finger at the same time. Basically, there’s nothing much you can do for it. You don’t want the finger to dislocate again, and the fact that it’s broken and dislocated kind of makes the injury a little bit worse. Right now, I’m supposed to wear a splint for a little while, and wait for the bone to heal. Then it’s just a waiting game. Everybody’s body heals differently. Hopefully, mine heals pretty fast. We’re really just going on a week-by-week basis. We’re going to be taking X-rays every week, continually doing rehab. I don’t want my finger to have any issues, so I’m constantly doing treatments on it every day, just taking it one step at a time. It’s obviously disappointing. The night it happened, I had trouble sleeping and couldn’t stop thinking about it. But after that, I realized that sometimes, these things happen, and it’s just a minor obstacle for me. It gives me an opportunity to learn from the sidelines, to work on other parts of my body, and try to do whatever I can to get back as soon as possible, So that’s kind of what my mindset is. My family—my wife, my father a little bit— and my agent, they all had really good things to say, and their conversations with me got my mind back on the right track. 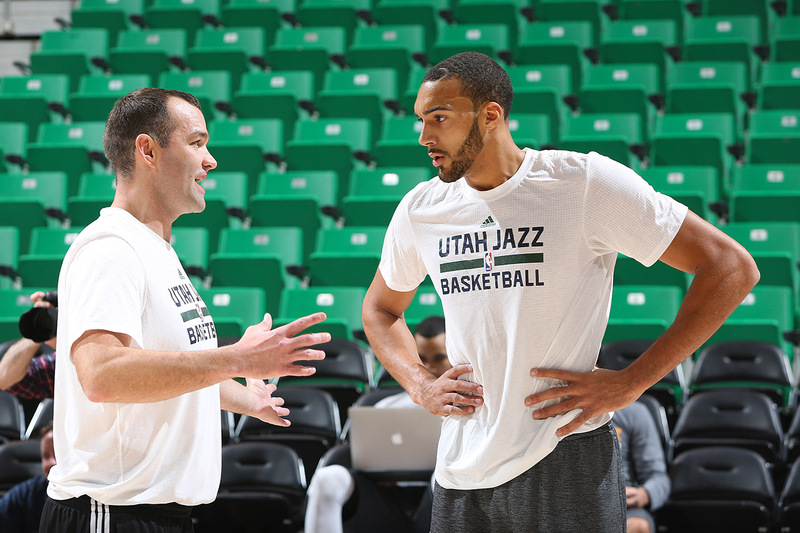 Johnnie Bryant, my assistant coach here at the Jazz, has also been really helpful so far. Everybody realizes that it’s not something what you want to have happen at the beginning of the year, but it’s not like I’m going to be out the whole season. I’m going to be back, and then it will be fine. It’s just a little obstacle that I can get over, a little challenge, a little adversity. Even though I’m out, my role is to still be involved with the team as much as I can. I’m still going to practices, going to games, trying to have a place with the team and be there to support my teammates, first and foremost. Cheer them on. Root for them. It’s an opportunity for me to be more vocal from the sidelines, to help guys out, from things that I see when I’m the bench and I see it out on the floor, just because I can’t be out there playing. So I have a lot of other things that I can offer and for sure, hopefully, my voice is one of them. My relationship with our coach, Quin Snyder, has continued to grow over the years, and although I’m not playing, there will still be an opportunity for us to discuss things that are happening on the court. Since I’ll be on the bench, I’ll be able to see maybe a little bit more of what he sees. So for sure, time to watch film, time to talk about what’s going on, and our relationship will probably be stronger by the end of the year. 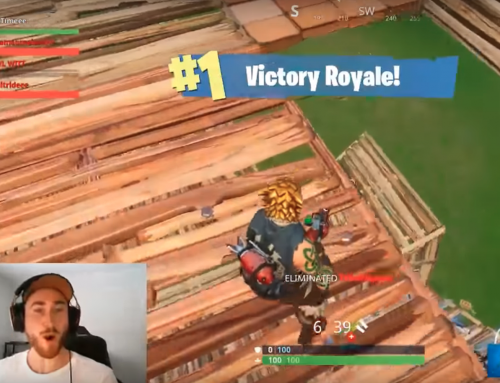 Watching the game from an up-top view will help me as a player. I think when you watch it, the game is a lot slower when you watch it than it is in person. You can really see where the openings are, see what defenses are doing, and really just try to learn. You’ve got to try to take positives with negatives, and even though my injury is a negative for me and for our team, I think we’ve got to try to take some positives out of it as well. Right now, we’re going to have guys in there that maybe haven’t closed the game before, guys in there that are put in situations where they’re playing really important minutes. Later down the road, that will only help them out, and make them better players, and make our team better overall. We expect to be really good defensively. We expect to be better than we were last season. We expect to make the playoffs this year. We all realize that we haven’t really accomplished much. I mean, besides Joe Johnson—the only guy on the team that has ever been an All-Star—it’s not like guys have had all these results and have been super successful. We’ve all gotten better and better, and we’re all improving each year. Some media members are coming around and they think maybe this might be our year. But for me, we still haven’t done anything. Nothing has changed. We have a lot to prove to people, and that’s the feeling across our team. We still have a long ways to go. Thanks Gordon for giving us this look into where you and the team are. I love reading your blogs and hope you will continue to write more often as time allows. God bless you and your family always. You guys got this! Everyone is a buzz across the league for a reason. We’re going to go show the league what Jazz basketball is all about! Great insight about your teammates! I’m so hyped for this season, even with the first loss at Portland. Wish you, Derrick, and Alec a quick recovery! This team is gonna be scary once everyone gets healthy. Had no idea you ring finger injury was that bad. I’m glad you shared what happened because that is certainly a lot worse than when I broke my ring finger. I understand why you need to take your time. Thanks for sharing. Get better soon gordo I got tickets to a game next week and really wanna see you play!